Occupancy sensor is a heat and light control device used to detect occupancy of space by people and accordingly turns light on or off by using infrared light rays, ultrasonic rays and microwave technology. Occupancy sensor is commonly used for providing automatic control, saving energy and complying with building codes etc. Increasing demand for energy saving devices have resulted into several technological advancement in occupancy sensors. Increasing demand for energy-efficient devices is one of the major factors responsible for the growth of global occupancy sensor market across the globe.Other factors such asfavourable government regulations and policies with regard to energy saving, continuous development and advancement of advanced and cost-effective sensors are expected to fuel growth of the global occupancy sensor market over the forecast period. In contrast, false triggering of switch and inconsistency issues associated with wireless network system are anticipated to impede the market growth during the forecast period. 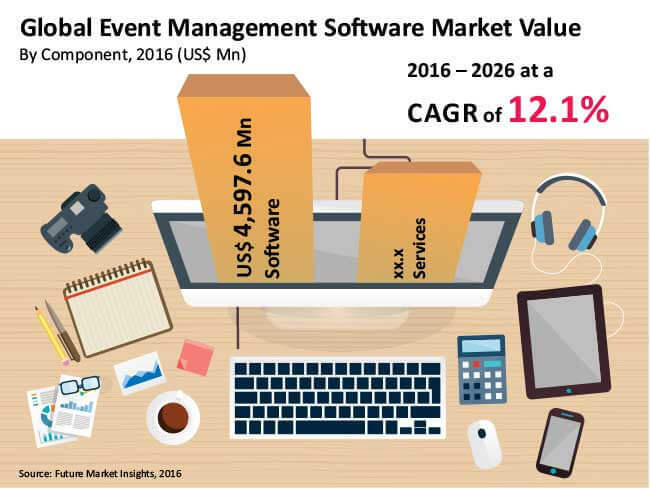 However, introduction of advanced occupancy sensors such as intelligent occupancy sensor, image processing occupancy sensor and micro-phonics in is boosting growth of global occupancy market. Global occupancy sensor market is segmented on the basis of type, network connectivity and application. On the basis of types, the global occupancy sensor market is sub segmented into ultrasonic sensors, passive infrared sensors, microwave sensors and others. Ultrasonic sensor uses high frequency sound waves in order to detect space occupancy. Passive infrared sensor uses heat movement detection to detect infrared radiation radiated out of human body movement while microwave sensor works on the same principle as of ultrasonic sensor but with high sensitivity as well as detection range as compare to other two types of occupancy sensor. On the basis of network connectivity, the global occupancy sensor market is segmented into wired network and wireless network. Wireless network is further sub segmented into Wi-Fi, Zigbee, Z-Wave and others. By application the market can be segmented into government, industrial, commercial and residential sectors. On the basis of region, the global occupancy sensor market can be segmented into seven major regions such as North America, Latin America, Western Europe, Asia-Pacific (excluding Japan), Eastern Europe, Japan and Middle East & Africa (MEA). Of these regions, the North America occupancy sensor market is expected dominate the global occupancy sensor market over the forecast period. However, Asia-Pacific (excluding Japan) is anticipated to witness the highest CAGR during the forecast period. This is mainly attributed to growth in construction and real estate sectors in developing countries such as India and China in the region. Key players operating in the global occupancy sensor market are Eaton Corporation Plc., Honeywell International Inc., Schneider Electric SA, Johnson Controls Inc., Acuity Brands Inc., Texas Instruments Inc., Leviton Manufacturing Co., Inc., Lutron Electronics Co., Inc., Legrand SA and Hubbell Incorporated among others. Major players in the market are focusing more on development of advanced and innovative sensors such as image processing sensor, micro-phonic based sensor and intelligent occupancy sensor in order to gain competitive advantage in the long term. Antenna transducers are the devices that are used to convert the radio frequency fields into alternating current and vice versa. Antenna transducer comprise of three components a receiving antenna, a transducer and a transmitting antenna. Transmitting antenna generates the radio frequency field that is transferred to receiving antenna which converts these radio frequency field in to alternating current by using transducer. To prevent gradual loss in transmitting signals due to weather change radome – a structure built around the antenna – is used. Rise in demand of surveillance & satellite communication system due to increase in terrorist activities across the world, integration of different technologies due to joint ventures among key players are the major factors driving growth of the antenna transducer and radome market. Also increasing application of antenna transducer in air traffic control and weather change tracking is expect to fuel growth of the market over the forecast period. However, high cost related to maintenance, manufacturing and setup of the system, requirement of highly skilled & experienced manpower are some of the key challenges for the antenna transducer and Radome market. Antenna Transducer and Radome market can be segmented into components, technology, and applications. On the basis of components, the antenna transducer & Radome market can be segmented into antenna, transducer and Radome. Among previously mentioned segments, antenna is the dominant segment owing to wide range of applications and its capability to integrate with different technologies. The technology segment includes radar and sonar. Radar systems are used to detect the position and movement of the object by using ultra high frequency or radio frequency waves. Radars are widely used in air traffic control, defence system and ocean surveillance systems. Sonar is used to detect the position and movement of underwater objects by using sound waves. On the basis of applications the antenna transducer and radome market can be segmented into aerospace and military. The Antenna transducer and radome market covers seven key regions namely North America, Latin America, East Europe, West Europe, Asia-Pacific excluding Japan, Japan and Middle East & Africa. North America was the dominant regional market in terms of value in 2015. This is mainly attributed to increasing defence budget in the region by U.S. and Canada government. However, APEJ antenna and radome market is expected to expand at a significant CAGR over the forecast period. Increasing government spending modernisation of military is the major factor fuelling growth of the market in the region. Increase in demand for commercial and military aircrafts especially in Europe is providing the favourable opportunity for major vendors to foray into the region. In terms of revenue, UK, France and Germany are the major shareholders of antenna transducer and Radome market in this Europe. Major players identified in the antenna transducer and radome market are Exelis Inc. (US), Thales group (France), Cobham plc. (UK), Lockheed Martin Corporation (US), BAE systems(UK), General Dynamics Corporation (US), Raytheon Company (US),Northrop Grumman Corporation(US), L-3 Communications Holdings Inc. (US), Leonardo-Finmeccanica (Italy). Key players operating in the market are focused towards entering into long-term contracts with ministry of defence and military in established and emerging markets. For instance, 2014, Thales group signed five-year contract with UK’s Ministry of defence. The motive behind this contract is to offer latter support for Sonar 2050 system used on the Royal Navy’s Type 23 frigate fleet. Semiconductor industry has witnessed drastic changes over the years and these changes led to make complex semiconductor manufacturing assembly lines. Semiconductor inspection system operates in the semiconductor production lines in order to improve the quality of manufactured semiconductor device. The primary functions of semiconductor inspection system to provide application support provisioning, yield and process management provisioning, and inspection and evaluation system module provisioning. There are various type of inspection required in the production line of semiconductor industry; in-line inspection, on-line defect analysis, and critical dimension-measurement in lithography. Moreover, wafer detection systems are also used to detect pattern defects and particles and analyzes possible causes for poor yield. There is a tectonic shift in semiconductor industry due to the exponential growth in internet of things (IoT) market. Without the semiconductor sensor technology, the existence of IoT cannot be imagined. Hence, the role of semiconductor inspection systems became more crucial in order to produce sensors of extreme quality. Now-a-days, miniaturization is playing a vital part in the manufacturing of the semiconductor devices. Miniaturization is immensely contributing in reduction of material cost, on the flip side of this, it is also increasing the complexity in the assembly lines. This might take the productivity of a particular assembly line to south. It has led to the demand of semiconductor inspection system that integrates and controls high-performance inspection and evaluation tools. In near future, Planarization process and multi-layer wiring will be more comely used in assembly lines of semiconductor industry. It can generate some serious inspection problems such as metal grain and color variations. The existing inspection systems aren’t capable to inspect and detect such kind of problems. It is the biggest challenges for vendors to provide inspection systems that are capable in eliminating these false defects in order to detect true defects. Wafer inspection systems assist semiconductor manufactures enhance integrated circuit (IC) chip gain. The IC industry deploys inspection system to detect defects that happen during the manufacturing process. The main function of these system to check whether the process is under control. If the system find any discrepancy during the manufacturing process, it indicate the root cause of the problem. Wafer inspection systems are holding maximum chunk of overall semiconductor inspection system market. In semiconductor industry, a mask or a photo mask is a series of electronic data that lay the foundation for photolithography steps of semiconductor fabrication. Mask inspection is nothing but task perform before actual fabrication of real mask. Since a mask acts as a light absorbing layer of semiconductor chip, the inspection of it is essential as the defected mask can entirely damage the semiconductor chip. KLA-Tencor, Applied Materials, Herms Microvision, Lasertech, ASML Holding, FEI, Hitachi High-Technologies, and Nanometrics are some of the key vendors of semiconductor inspection system market. The North America region holds the largest market share of global semiconductor inspection system market. The semiconductor device manufactures are speeding huge amount of money in countries such as US and Canada in order to expand their capacity and opening the new facilities. The North America region is also home to many of the key vendors of semiconductor inspection system. The Asia Pacific region is closely following the North America region and is expected to have the highest growth rate in coming future due to the growth of semiconductor industry in countries such as China, Taiwan, and Japan. In the Europe region, the semiconductor inspection system market is witnessing moderate growth rate. Germany is contributing immensely in the Europe semiconductor inspection system market as it is the largest electronics manufacturing country of the Europe. Germany is also hub of automotive and industrial electronics. Moreover European semiconductor vendors are eying to acquire US companies. For instance, in 2015 NXP Semiconductors acquired Freescale and became the largest player in the automotive semiconductor market. The strong merger and acquisition outlook in semiconductor industry will further drive the growth of semiconductor inspection system market in Europe. A base transceiver station (BTS), also called as radio base station (RBS), is an equipment that enables wireless communication between user equipment, such as mobile phones, WLL phones and computers, and a network. The equipment sends/receives radio signals to/from user equipment and converts them to digital signals. These signals are passed on to the network to route to other terminals in the network or to the Internet. The term BTS is applicable for any type of wireless communication standards, it is generally used with respect to mobile communication technologies such as CDMA and GSM. A BTS is controlled by a base station controller. BTS offers several benefits such as faster telephony coverage to remote places, promotion of universal access to ICT services, easing information dissemination and supporting a broad range of value added services in under-served and unserved areas. Growth in maturity in voice communication market and declining ARPUs, has paved way for telecom operators to explore the new business opportunities, such as mobile data, to generate higher revenues. Over the past few years, mobile traffic has witnessed an exponential growth globally, adding load on existing telecom infrastructure. This increasing load is creating the need for new BTS installations. Major factors propelling the global market of BTS include expansion of telecom infrastructure, growing mobile subscriber base in rural areas and growth in telecom tower sharing business. The high growth in the number of mobile subscribers along with increasing data traffic and declining tariffs is continuously increasing the load on existing telecom infrastructure globally. Additionally, with stringent government regulations regarding restricting the harmful effects of radiations from new tower installations, increasing number of telecom players are adopting tower sharing business model. Moreover, growing 3G and 4G subscriber penetration and government initiatives to facilitate the achievement of the AMPE (Accelerated Mobile Phone Expansion) Programs, is expected to fuel the BTS market during the forecast period. Global BTS market is mainly classified on the basis of components and geographies. On the basis of components, global BTS market is segmented into antennas, transceivers, duplexers, amplifiers and others (combiner and alarm extension system). The transceivers are further sub-segmented into single (sTRU), double (dTRU) and composite double radio unit (DRU). The major players active in the Global BTS market include Nokia Solutions and Networks, Telefonaktiebolaget LM Ericsson, Huawei Technologies Co. Ltd., ZTE Corporation, Advanced RF Technologies, Inc., GSTeletech Co., Ltd. Shenzhen Hexinkaiye Electronic Telecom Co., Ltd and Alcatel-Lucent. Ergonomic keyboards are designed to incorporate ergonomic considerations such as unique angled design, key sensitivity, and wrist support - allowing the wrists and hands to rest and move more naturally while operating keyboards. Despite the fact that ergonomic keyboards do not necessarily eliminate complex cases of repetitive stress injuries (RSIs) and carpal tunnel syndrome, they do however offer some degree of relief to people with moderate levels of such problems. Ergonomic keyboards are being adopted at a brisk pace by several industries such as IT, oil & gas, energy, and communications. Rising awareness about RSIs and carpal tunnel syndrome is expected to encourage further adoption of ergonomic keyboards leading to substantial market growth during the forecast period. Future Market Insights offers a 10-year forecast of the global computer keyboards market between 2015 and 2025. The report defines 2014 as the base year and provides data for the following 12 months. In terms of value, the computer keyboards market is expected to register a CAGR of 2.3% during the forecast period. This research report provides a detailed analysis of ergonomic keyboards to identify factors driving the popularity of these keyboards across different verticals. This study demonstrates market dynamics and trends of regions, which influence the current nature and future status of the computer keyboards market during the forecast period. Additionally, the report comprises segments such as end-user preference analysis, cases of RSIs, and overview of different keyboard layouts to provide a clear picture of the market. A detailed analysis of the value chain and Porter’s five forces analysis further empowers clients to formulate strategies for every stage of their business. Rising demand for comfortable devices at workplaces is advancing the adoption of ergonomic keyboards, which have become quite popular among employees who perform significant amounts typing. Additionally, leading players operating in the industry are marketing products through multiple distribution channels to increase sales across the globe. This ensures wider and easier consumer access to ergonomic products and boosts market growth. This report provides FMI’s analysis on key trends, drivers, and restraints influencing the global computer keyboards market. The weighted average model is leveraged to identify the impact of key growth drivers and restraints across various geographies in order to help clients frame accurate business strategies. On the basis of type, the market is segmented into basic keyboards and ergonomic keyboards. A detailed analysis has been provided for every segment in terms of market size. The ergonomic keyboard market is further categorised on the basis of type (vertical, compact, adjustable, split, and others), switching mechanism (membrane based and mechanical), size (standard, laptop, thumb-size, and numeric keyboards), and applications (corporate, personal, and gaming). The report provides a detailed analysis for each segment in terms of market value (US$ Mn) and market volume (thousand units) for the computer keyboards market across the globe. Key regions assessed in this report include North America, Latin America, Eastern Europe, Western Europe, Asia Pacific (excluding Japan), Japan, and Middle East & Africa. In addition to this, a detailed analysis covering key trends, absolute dollar opportunity, and BPS analysis has also been presented. Given the ever-fluctuating global economy, the report not only forecast the market on the basis of CAGR, but also analyses the impact of key parameters in each year of the forecast period. This helps client to understand the predictability of the market and identify the right opportunities across the market during the forecast period. Also, a significant feature of this report is the analysis of all vital segments in terms of absolute dollar opportunity. Absolute dollar opportunity is critical for assessing the level of revenue opportunity in the market. In the final section of the report, computer keyboards market competitive landscape is included in order to present the client with a dashboard view based on the categories of providers in the value chain, product portfolios, and key differentiators. This section is important for gleaning insights about the participants in the market’s ecosystem. Additionally, it enables identification and evaluation of key competitors based on in-depth assessment of their capabilities and successes in the marketplace. The report provides comprehensive profiles of the providers to evaluate their long-term and short-term strategies, key offerings, and recent developments. Key competitors covered in this report include Microsoft Corporation, Logitech International SA, Kinesis Corporation, Gold Touch Enterprises Inc., Adesso Inc., Fellowes Inc., Posturite Ltd., Datadesk Technologies, Fentek Industries, Inc., and Shenzhen V4 Electronics Co. Ltd. In order to evaluate the market size, revenue generated by computer keyboards manufacturers has been taken into consideration. Average selling price for each product, across each region was taken into account for estimating market revenue across respective regions. Moreover, market estimates have been analysed keeping in mind different factors including technology, environment, economic, legal, and social. In order to provide correct market forecast statistics, the current market was sized as it forms the basis of computer keyboards market during the forecast period. Given the characteristics of the market, we triangulated the outcome of three different types of data including secondary research, primary research, and data from paid databases. Primary research represents the bulk of our research efforts, supplemented by extensive secondary research. Secondary research includes key players’ product literature, annual reports, press releases, and relevant documents, recent trade journals, technical writing, internet sources, trade associations, agencies, and statistical data from government websites. This collated data from primary and secondary data sources is then analysed by the in-house research panel using market research statistical tools. The modern computer technology has successfully created an exciting as well as a pioneering avenue that leads towards a future where anything that man envisages might be possible. Well, Virtual Reality (VR) is one such technology that is helping mankind travel towards that direction. VR-based virtual environments are helping organisations to overcome critical challenges that were much more difficult to tackle previously. Similarly, the advent of augmented reality (AR) has revolutionised the way of experiencing real- world environment using consumer electronic devices such as smartphones, digital headgear and laptops. Future Market Insights’ latest report identified following factors that are driving the adoption of augmented reality and virtual reality worldwide. Gaming continues to be an attractive segment for AR & VR technology. In recent years, several games have been launched based on augmented reality. ‘Pokemon Go’ is one of the biggest examples of AR-based games, which received massive popularity across the globe after its launch. The young population is lured toward products that come with AR and VR features. Over the years, the average spending on electronic goods for entertainment has increased significantly. Moreover, robust penetration of smartphones and improving network connectivity is encouraging tech companies to add AR & VR features in their digital products. Evolution of cell phones from a normal calling device to a smart gadget is facilitating innumerable opportunities for technologies such augmented reality and virtual reality. Technology companies making heavier investments to further simplify AR and VR technology and also add more feature to them. This, in turn, is prompting the adoption of such technologies in various industrial verticals as well. The aforementioned mentioned factors are well supporting the growth of global augmented reality and virtual reality market, which was valued at US$ 5,176 Mn in 2016. The FMI report projects that more than one-third of the market’s revenue will be accounted by application of AR and VR technology in gaming in 2017. However, AR and VR application in media & entertainment are expected to increase over the next couple of years. Meanwhile, the head-mounted display is identified as the most preferred device for experiencing best quality AR or VR features. Currently, virtual reality is more prevalent as compared to augmented reality, which is why VR-based applications account for a major chunk of revenue of the global market. VR technology is expected to witness a CAGR of 40.5% in revenue between 2017 and 2025. However, AR technology is anticipated to get more effective in the forthcoming and witness a faster growth in terms of value. According to the FMI report, the AR and VR market in MEA is set to witness the fastest growth, expanding at a CAGR of 55% during the forecast period. The market in North America, likewise, is also projected to surge at an impressive pace. In terms of revenue, North America’s market is expected to remain dominant throughout the forecast period and expected to be valued at US$ 43,335 Mn by 2025 end. Vuzix Corporation, Samsung Electronics Co. Ltd, Osterhout Design Group, Inc., Oculus VR, LLC, Microsoft Corporation, Google Inc., Magic Leap, Inc., Blippar.Com Limited, DAQRI LLC, and EON Reality Inc. are some of the leading players in the global augmented reality and virtual reality market, profiled in the report. For a long-term outlook, FMI delivers an optimistic picture by estimating the global AR and VR market to reach a valuation of US$ 119,540 Mn by 2025-end. In terms of revenue, the global market is expected to increase at a CAGR of 42.2% during the forecast period (2017–2025). Dual-clutch transmission (DCT) market is expected to expand at a steady rate in 2016. However, consumer dissatisfaction with the technology in developed markets can create significant challenges for manufacturers during the forecast period. The sluggish growth in developed markets will be compensated to a large extent by robust adoption in Asia Pacific. Higher fuel economy and convenient driving experience will continue to influence consumer preferences in Asia Pacific, providing an uplift to dual-clutch transmission market. Strict regulatory compliance targeted to curbed carbon emissions will continue fuelling demand for the technology in 2016. DCT technology is witnessing an uptick from manufacturers, as it serves as a differentiating factor. In order to achieve fuel efficiency and lower carbon footprint, adoption of DCT technology by manufacturers for integration in hybrid vehicles, will push the demand for DCT technology. Stellar growth in manufacturing and sales of vehicles in Asia Pacific will also play a key role in driving demand for DCT technology. Rising environmental awareness is catapulting the demand for lower carbon footprint technologies. OEMs are meticulously following the emission standards to meet stringent environmental regulations. Consumers are seeking enhanced driving experience, pushing the demand for the technology further. However, consistent criticisations and unfavourable customer reviews regarding the technology’s performance and comfort will continue to deter the market growth. In addition, cost-intensive cost of DCT technology is expected to restrain its penetration in small and medium sized vehicles in developing economies. Based on product type, dry clutch transmissions segment will retain dominance over wet clutch transmissions, owing to economical costs. Dry clutch transmissions are estimated to experience hefty sales of nearly 3,755 thousand units in 2016, attributed to their application in passenger vehicles. On the basis of end use, passenger cars segment currently dominates over commercial vehicles, with over 80% of the market share. The Y-O-Y growth will however decline from 12.6% in 2016 to 11.7% in 2017. Based on region, the technology will continue to gain traction among manufacturers in Asia Pacific. North America, Western Europe, and APAC collectively contribute around 85% share to the global market revenues. N. America and W. Europe are expected to continue declining markets for dual clutch transmission technology, losing revenue shares to APAC. China, being the largest automotive market, is anticipated to reaffirm the highest adoption of DCT technology. Markets within APEC, including China, India, and Japan will witness introduction of compact DCT technology for compact sized vehicles. OEMs and suppliers are increasingly collaborating to improve DCT penetration in suppressed markets. Following the effort by OEMs and suppliers toward reduction in prices, DCT market may experience optimistic scenario. APAC will register the largest market in terms of volume, followed by Eastern Europe, Western Europe, and Middle East & Africa (MEA). Japan is a saturated market and will witness sluggish growth. Key players competing in the dual clutch transmission technology market, include BorgWarner Inc., Getrag, ZF Friedrichshafen, Continental, and Eaton Corporation. Leading companies are increasingly focusing on the rising demand for DCTs, by increasing production capacity in Asia Pacific. Long-term Outlook: Global market for dual clutch transmission technology will witness a promising CAGR of 11.3% by value, over the forecast period 2014-2020. APAC will register the highest CAGR of 16.1% by value, by 2020 end. Social business intelligence refers to the management technique that merges groups to share data effectively in order to improve overall efficiency of operational processes. It offers better opportunities to employees for recognising customer demand through open management of product and resources. Social business intelligence also aids in improving various aspects of analysis, social media and analytics. Revenue generated from the deployment of social business intelligence solutions worldwide is estimated to be nearly US$ 17 Bn in 2017, and is projected to reach a market valuation of nearly US$ 29 Bn by 2026, reflecting a CAGR of 6% over the forecast period (2016-2026). Presently, most of the private organisations are adopting big data solutions to capture and store large amounts of unstructured data. Big data supports in managing unstructured data fully or partially from enterprise IT systems, CRM conversations and social media. Big data offers hadoop solutions, which enable users to manage, store and analyse data across numerous resources efficiently. For instance, in September 2014, Oracle launched business intelligence cloud service which aids to improve speed and decision making across organisations by lowering barriers. Moreover, big data solutions also offer secure, comprehensive information access with simplicity and cost effectiveness. In social business intelligence systems, one of the main challenges faced by organisations while adopting cloud services is data security. With an increase in the demand for cloud-based services, most of the organisations are shifting their workloads to the cloud from on-premise systems. Security breaches and privacy concerns pertaining to sensitive data are big challenges faced by vendors offering cloud-based solutions. Installation of new enterprise data operating systems over SQL servers would have a positive impact on the global social business intelligence market. Distributed analytic framework such as MapReduce will gradually turn Hadoop into a general-purpose data operating system. Hadoop offers adequate performance with optimal costs and also handles different kind of workloads such as steam processing and graph analytics. This, in turn, is likely to drive the demand for Hadoop implementation in social business intelligence and will boost the market in the long run. 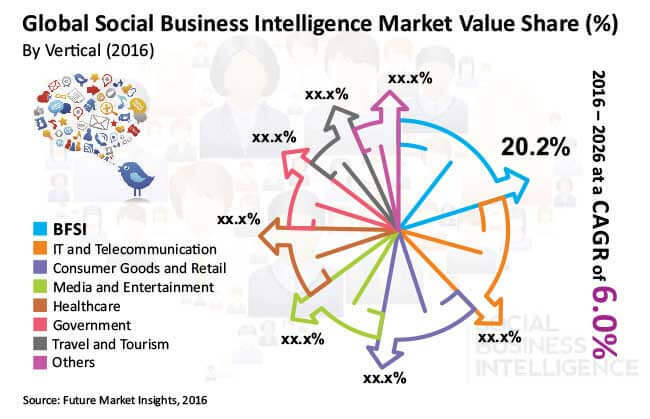 In terms of value, BFSI segment is projected to be the most attractive segment in the global social business intelligence market during the forecast period. However, the travel and tourism segment is expected to register high Y-o-Y growth rates throughout the forecast period. In terms of value, the travel and tourism segment is expected to register a CAGR of 7.5% during the forecast period. In 2017, the IT and telecommunication segment is estimated to be valued at nearly US$ 3 Bn and is expected to witness steady growth in terms of revenue throughout the forecast period. Noise Vibration Harshness (NVH) Testing market is growing at a higher pace due to the rising competition for developing quietest and smoothest components to reduce noise in cars, washing machine and other machines . Noise Vibration Harshness (NVH) Testing is also known as sound quality analysis of various metrics such as loudness and sound exposure level. Domestic appliances manufactures are increasingly adopting sound quality analysis to improve their product in comparison with competitor. Noise Vibration Harshness (NVH) Testing includes equipment such as analyzers, controllers, sound level meters, microphones, and other software. The Noise Vibration Harshness (NVH) Testing market is growing significantly due to adoption of Noise Vibration Harshness (NVH) solutions in product development process and growing usage in various industries such as aerospace and defense, automotive, consumer goods, construction and others. The major factor driving the adoption of Noise Vibration Harshness (NVH) Testing is the rising need to improve product quality among manufacturers for product differentiation. Moreover, rising health concerns among individuals for safety has also helped Noise Vibration Harshness (NVH) Testing market to increase. The advantages of this Noise Vibration Harshness (NVH) Testing are also creating huge potential for this market such as real time multi-analysis in one test run, reduction in lead time, and others. The key challenge for Noise Vibration Harshness (NVH) Testing is lack of supporting database to improve NVH test simulation. There is limited databases available for NVG testing due to which software developers face difficulty in improving the process of developing Noise Vibration Harshness (NVH) Testing. Moreover, various complexities in selecting suitable NVH test equipment is the another major challenge faces by developers. In October 2016, Henkel an automotive company has launched the acoustic lab in India for automotive and general industry. This launching of innovation center will help company to create and offer advance technology based solutions along with the inclusion of Noise Vibration Harshness (NVH) solutions. In July 2016, Brüel & Kjær, a sound and vibration measurement technology provider has acquired Sound & Vibration Technology Ltd. in order to enhance its capabilities in global engineering services. Presently, North America is holding the largest market share for Noise Vibration Harshness (NVH) Testing solution market due to huge adoption of these solutions in cars, washing machine, vacuum cleaner. The adoption of hardware and software solutions of Noise Vibration Harshness (NVH) Testing is also impacting the market for Noise Vibration Harshness (NVH) Testing in a positive manner. Companies such as Head Acoustics is also working towards the Noise Vibration Harshness (NVH) Testing platforms with the partnerships and acquisitions in this market to enhance market position. In Europe region, the market for Noise Vibration Harshness (NVH) Testing is witnessing high growth rate due to the increasing demand for quiet machines. The Asia Pacific region is following the Europe region in Noise Vibration Harshness (NVH) Testing market. This market is expected to have the highest growth rate in coming years due to the adoption of new and advance machines. Magnetic Field Sensors market is growing significantly due to increasing applications of these Magnetic Field Sensors in various industries such as healthcare, consumer electronics, aerospace and defense and others. Moreover, the rising use of these Magnetic Field Sensors for monitoring temperature, detect changes, and provide an interface that can sense, process, and/or control the surrounding environment. Magnetic field sensor can be called as a device that is used to understand the magnetic field around coil or some electrical device. These Magnetic field sensor includes rotating sensor tip that measures both transverse and longitudinal magnetic fields around the particular objects. Moreover, these Magnetic field sensors includes Hall Effect transducer that helps in measurement of vector component of magnetic field near to the sensor tip. Furthermore, Magnetic field sensor used to measure two ranges of magnetic field; measurement of strong magnetic fields across permanent electromagnets and measurement of weak magnetic fields such as Earth’s magnetic field. The major factor driving the adoption of Magnetic Field Sensors market is the increasing government support for development of eco-friendly vehicle. Moreover, continuous development in the market of automobile infotainment systems is also helping this market to grow. Other factors that are driving this magnetic field sensors market are the growing usage of high quality sensing devices and increasing applications of magnetic sensors such as navigation. The key challenge for Magnetic Field Sensors market is high cost of development. The process of developing magnetic field sensors is too long and requires huge amount to be invested due to which manufacturers of magnetic field sensors face difficult in developing these sensors in a shorter period of requirement. Moreover, while in development process lack of infrastructure, supporting capabilities and economy of scale to compete against IDMs acts as another factors that restraints this market from growth. In October 2016, AMS, a sensor and analog solution provider has entered into the agreement to acquire Heptagon, an optical packaging and micro-optics solution provider. This acquisition will help AMS to improve its positioning in optical sensing technologies market. In March 2016, Analog Devices has entered into the agreement to acquire SNAP sensor SA, a sensing technology provider. This acquisition will help Analog Devices in increasing its client base and position in sensing, signal processing and platform-level Internet of Things (IoT) solutions market. Presently, North America is holding the largest market share for Magnetic Field Sensors market due to high adoption of these sensors in various industries such as automotive, consumer electronic and healthcare. There is a high adoption of these magnetic field sensors because they outperform potentiometers, reed sensors, and mechanical switches at higher performance levels due to their robustness and the elimination of mechanical wear, a common source of premature failure. MR sensors feature inherently low hysteresis and high linearity for improved measurement accuracy. In Europe and Asia Pacific regions, the market for Magnetic Field Sensors is witnessing high growth rate due to the increasing demand due to their ability to enhance the user navigation experience in consumer electronic devices. Over the past two decades, terahertz technology has been witnessing significant advancements on the scientific front. Terahertz technology is an emerging field which has potentials to improve applications ranging from passenger scanning at airports to huge digital data transfers. Terahertz radiation is located between the frequency bands of microwaves and infrared radiation, and are capable of easily penetrating into various materials, including biological tissue. The energy carried by terahertz radiation is low enough to pose no risk to any object under investigation. Technological advancements have enabled terahertz frequency band accessible for imaging systems. Many manufacturers are currently focused on developing new devices that can send and receive radiation of terahertz frequency range. Terahertz technology has found various application in various fields such as spectroscopy, imaging and communication systems, over the years. Additionally, the growing application of terahertz technology in a number of industries for quality check and process control monitoring is expected to enable terahertz components and systems to register a remarkable rise in the coming years. Increasing adoption of terahertz technology in industries such as aerospace and defence and homeland security across regions is thereby driving the market for terahertz technology over the forecast period. In addition, some of the prominent drivers for terahertz technology market are factors such as increasing investments in R&D activities, growing penetration of terahertz technology in biology and medical science sectors and increasing applications of high end terahertz devices in research laboratory and process control monitoring processes. On the other hand, factors such as lack of awareness of terahertz technology can result into slow adoption rate and concerns regarding accuracy and reliability issues may act as a major restraint for the terahertz technology market. Terahertz technology market can be segmented on the basis of component, application, vertical and regions. On the basis of component the terahertz technology market can be segmented into terahertz sources, terahertz detectors and others. On the basis of system, the terahertz technology market can be segmented as terahertz imaging, terahertz spectroscopy, terahertz communication systems and others. Whereas the application segment in the terahertz technology market may include industrial, defence & security, biomedical, wireless communication and others. Regionally, terahertz technology market can be segmented into North America, Latin America, Eastern Europe, Western Europe, Asia Pacific excluding Japan, Japan, and Middle East and Africa. Terahertz technology market is dominated by the North America region. North America dominance is attributed to rising adoption of process control in various industries as well as high investments in R&D activities pertaining to terahertz technology by key players based in the region. On the other hand, Asia Pacific Excl. Japan, and Japan is expected to grow at a significantly as compared to the other region in the terahertz technology market and will see a good growth rate in the future. Asia Pacific Excl. Japan is expected to great opportunities terahertz technology market due to the wide presence of manufacturing companies in developing countries, such as China, and India. Eastern Europe, Latin America and MEA is expected to see a moderate growth rate in the terahertz technology market. Among the prominent players involved in terahertz technology market, companies such as Advantest Corp, TeraView, EMCORE Corp and Terasense Group, Inc., among others are focusing on organic as well as inorganic strategies to strengthen their position in the terahertz technology market. For instance, in December 2016, Terasense Group, Inc. launched terahertz wave-sources based on ‘IMPATT’ technology for imaging scanners. On the other hand, in 2015, TeraView launched a continuous wave terahertz system ‘CW Spectra 400’ along with fibre fed external devices.